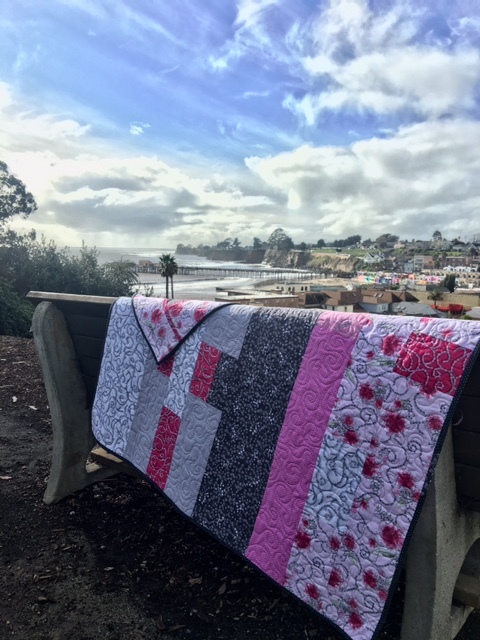 What better way to begin the New Year than with a #BeeSewcial theme of Resolution by Stephanie, Spontaneous Threads. 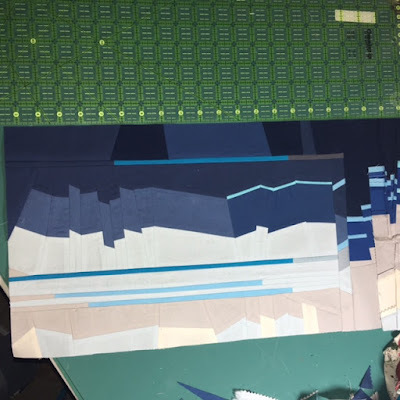 Using the color palette and inspiration from the pastel landscape of icebergs and Ted Talk by artist Zaria Forman, she asked us to create a panoramic block reflecting our personal resolution for 2017. How appropriate it is that I'm finishing down to the wire in the final days of the month given that I've chosen: "Avoid Binge and Burnout". Not the eating disorder but the same unhealthy principals I suppose. My resolution is to be mindful of impulses. Creative enthusiasm that leads to (thankfully momentary) Flat Line. It's hard to explain or pin point because some of the most enjoyable, successful and satisfying makes of 2016 fall under this category. I don't know why I thought the breeze and harsh sunlight would be any easier to photograph. But a scenic block deserved a shot at a shoot. The end result was less scrappy than I had originally planned. The movement with shapes seemed to illustrate the theme and combining in a wide variety of colors felt like a distraction. There are however slight changes in the aqua lines that are hard to capture. Sound familiar? Drop everything and sign up for, be part of, buy this, attend that resulting in deadline panic, self doubt, broken connections, missing sewejo etc. Recognizing that when I return from a retreat or workshop and my sewing supplies sit unpacked might be a sign. Acknowledging that the pretty new bundle of "I can't live without" fabric line sitting on the shelf manifests guilt. The bursts of IG posting, commenting, blog reading and writing followed by silence and the desire to literally do nothing. Resolutions are to me a time consider a better way to be. This early layout layout felt too controlled and direct for the message I wanted to convey. I'm not saying that the price of pulling an all-nighter when so inspired then needing a nap for the next few days or laying awake with insomnia because the how-to and what-ifs about bringing a design to reality are running through your head isn't sometimes worth it. Writing about this, reminds me of the love/hate relationship I have with the convenience of things like Netflix's watch next episode, Automatic Bill Pay, Amazon One-Click Checkout and my phone alerting me of - well just about everything. Seems smart to park myself somewhere shy of blinds eye. Let's call it "Pick and Choose". The straight thin lines can also represent being on even keel while the broken jagged ones suggest the state of being overwhelmed and pulled in many directions. A sense of disconnect in an attempt to connect, a byproduct of social media. The process was very reminiscent to when I created the Transition block, but less colorful. Quite often themes will carry over from one challenge to another. Rarely do the ideas work themselves out in just one project. This has been a really good exercise. Other than the usual vow to use stash, organize my sewing space and finish up WIPS, I don't typically make Resolutions. After all that requires insight and assessment while my expertise is more along the lines of procrastination and denial. 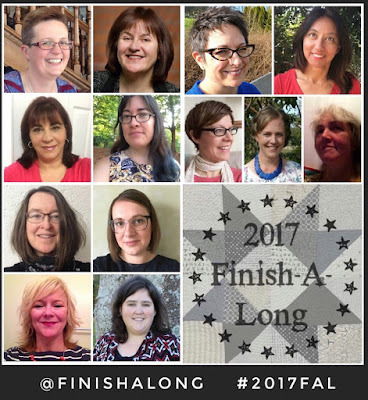 I hope you'll take the time to visit Stephanie's thoughtful blog post describing the challenge. Much of what my bee mates have written about their blocks resonate closely. Here are a few: Marci's, Felicity's , Anne's , Debbie's, M-R's , Silvia's and Hilary's. 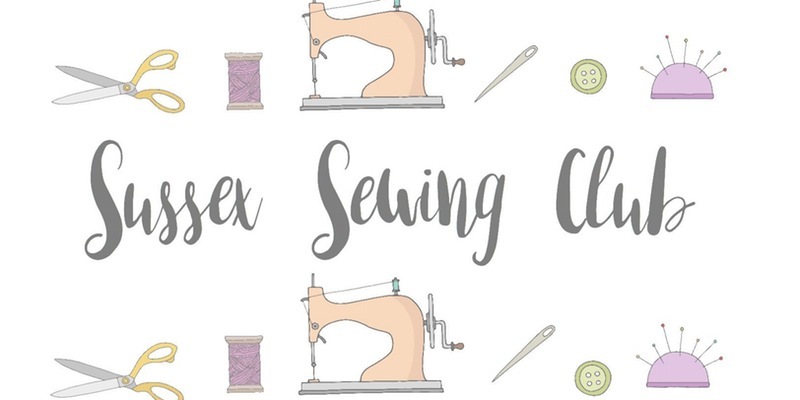 As always, everyone is encouraged to sew along with the theme using the hashtag #inpsiredbybeesewcial on Instagram. Check back soon because I will be revealing the February challenge as queen bee. Technically there isn't a To Do - Part One. If you know me or have followed my blog for a time, you're probably not too surprised. Posting a rhyming title is worth the confusion later (priorities, right?) After all a title like "unofficial things I want to remember to do but forgot to include on my list" isn't all that catchy. Before we get to that, I'd like to announce the Fabric Giveaway winner from this Sweet Rebellion post. Congratulations Kathy E, I'll email you for info on where to mail your goodies. 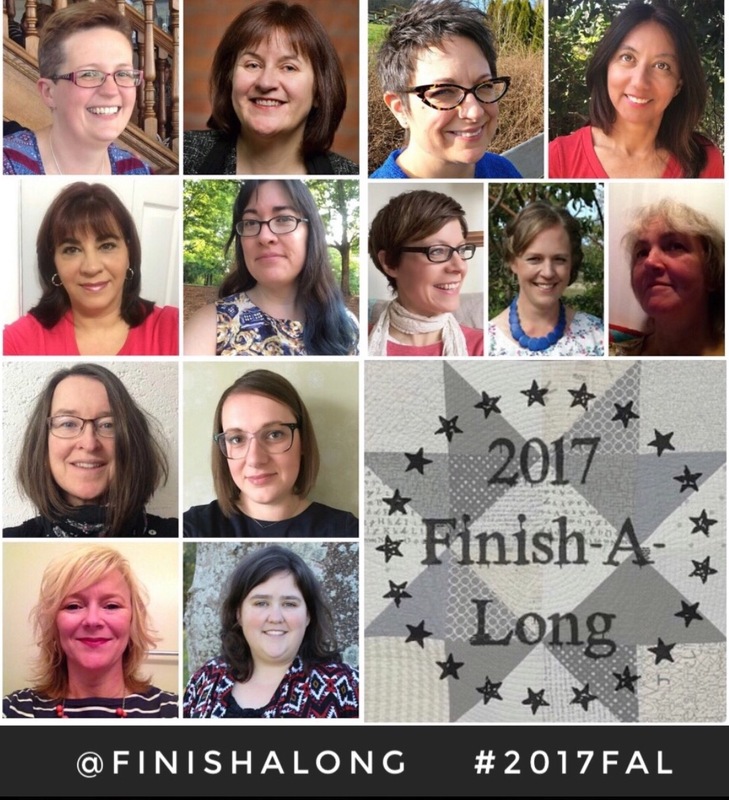 In all of the excitement of being a 2017 FAL Host and making my own Q1 list, I neglected to include on that post the unofficial other things to track and get done. I like having them all in one place for reference but a supplemental post works too. Most of my list hasn't even been blogged about. I'm still getting back into a routine of posting here and hope to elaborate soon but until then, you can peak on my Instagram feed and catch a glimpse of most. January "Resolution" BeeSewcial block for Stephanie - by end of month Here is a link to Stephanie's post. Hang sleeves, label and mail QDAD "Bend, Don't Break", "Break" and Quilt of the Month "Note to Self"- asap My first time to have quilts at QuiltCon so I want to be sure they actually make it there!!! Mend the Cinderella dress and mermaid doll- asap, because who can say no to little M.
Despite the looming deadlines and goals, I've been in kind of a sewing slump. Thanks to the boost of my friend Sue who I can always count on to keep me creative and express beyond fabric, I haven't been completely void of creativity. 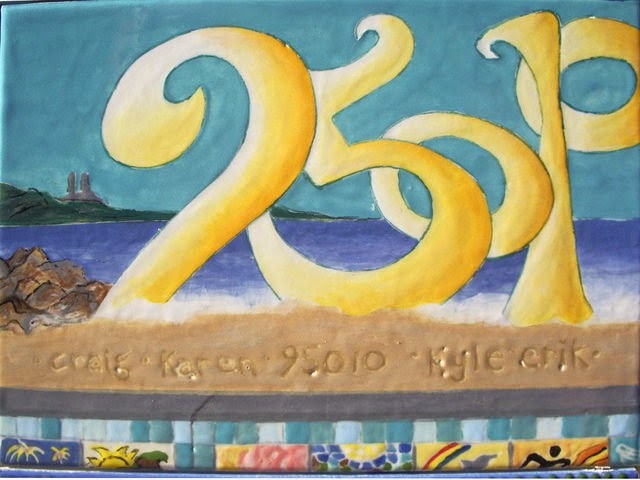 We spent last Friday and again last night painting our projects at Petroglyph Ceramic Lounge. It's our old stomping ground and the gap since we last played there is much too great. I'm finishing up two unfired bowls that I "misplaced" and then discovered as well as starting a new plate. The colors above give you a hint about what that might look like and it is going to be based on something quilty but I want to surprise you (after I see if my vision translates). The bottom of the footed bowl includes the date I painted this bowl for hubby. Way too long ago. At the time I was having fun with typography something that sneaks its way into my artwork when I'm not looking. Even when my attempts are epic fails like the 95010 zip code tile that reads as 25% instead, I am still proud of it and the greater concept. 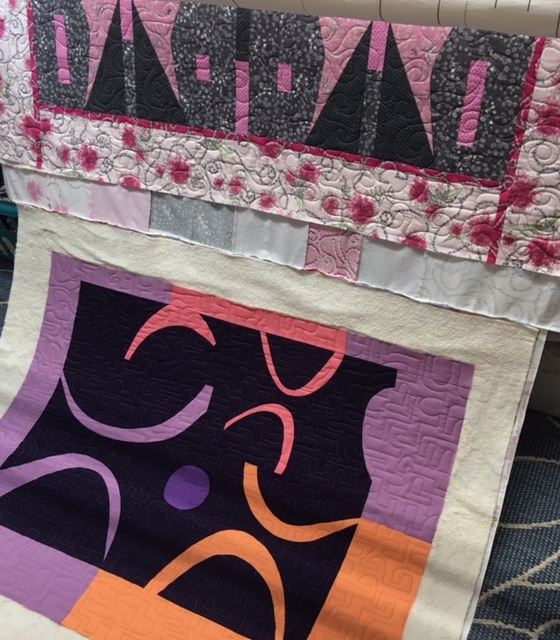 There is a quilt design lurking where lettering is featured - maybe I need to officially add that to the list to make it happen but I'll wait because it's already feeling a tad bit overwhelming. Hi ! 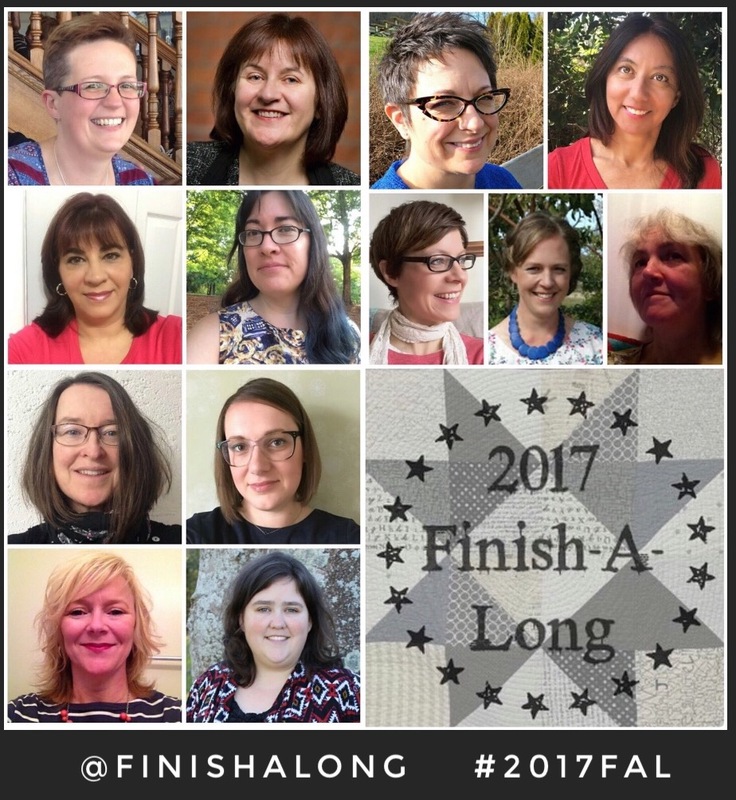 My name is Nicky Eglinton and I'm one of the global 2017 Finish-A-Along hosts. This is my second year as co-host so I should know what I'm doing. 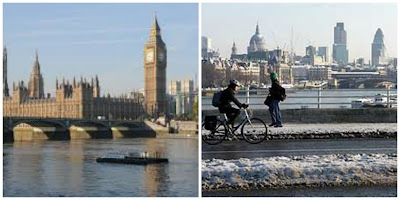 I live in the South of England but was born in bonnie Scotland and after a few years studying in Aberdeen and Glasgow, I came to London to get my first job! I loved the theatres, cinema, restaurants, walking across Waterloo Bridge and looking one way at the Houses of Parliament and the other way at St Paul's. Life was good! Since then I have moved even further south and out of the hubbub of the City to the quiet more rural life of Sussex to raise a family with hubby. It has suited us well and we have three lovely children and a cat and a dog! 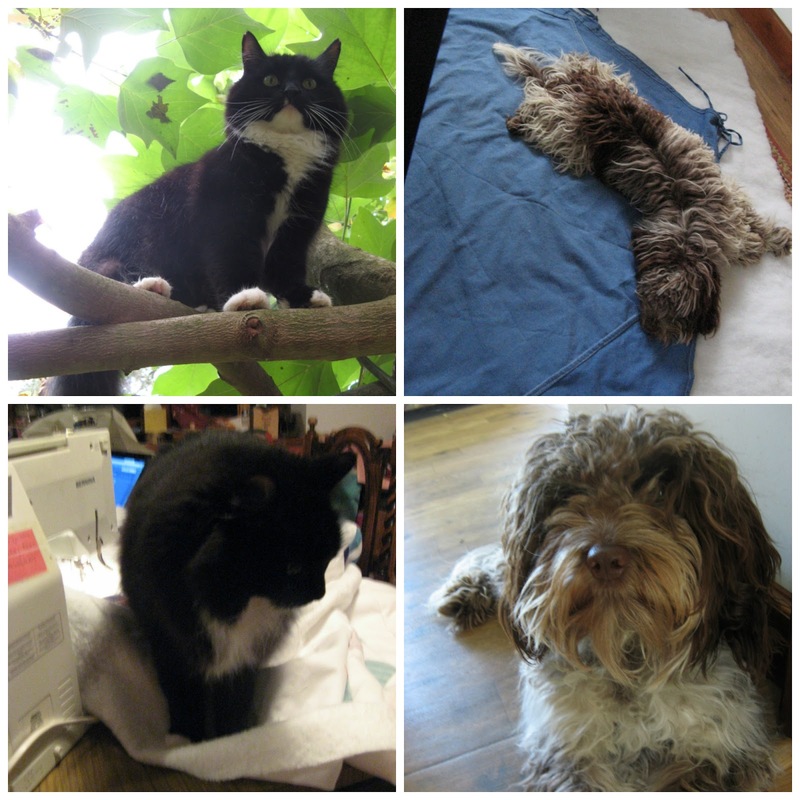 Here are the pets in portrait and 'helping' me quilt! In my childhood I learnt to stitch from my mother - first toys, and cross stitch, then clothes in my teens and twenties (back then it was actually cheaper to do that). 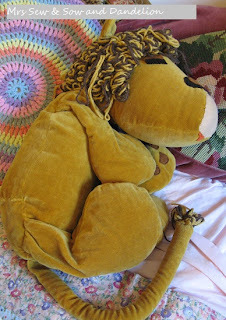 Meet Dandelion - I still have him! She also taught me knitting and crochet. She loved passing on her skills though we struggled at times as she was right handed and I was left handed. Every thing I did looked wrong to her as I was doing it in what seemed an awkward way....and there were very few lefthanded tools to help! So I now prefer right handed scissors - in fact I cannot use lefthanded ones!! 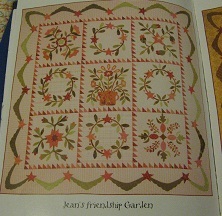 Jumping forward a bit, to maintain my sanity after kid no 1, I went to an evening class about patchwork and quilting. My chance to talk with grown ups! I was completely in love with applique! It was all I did! 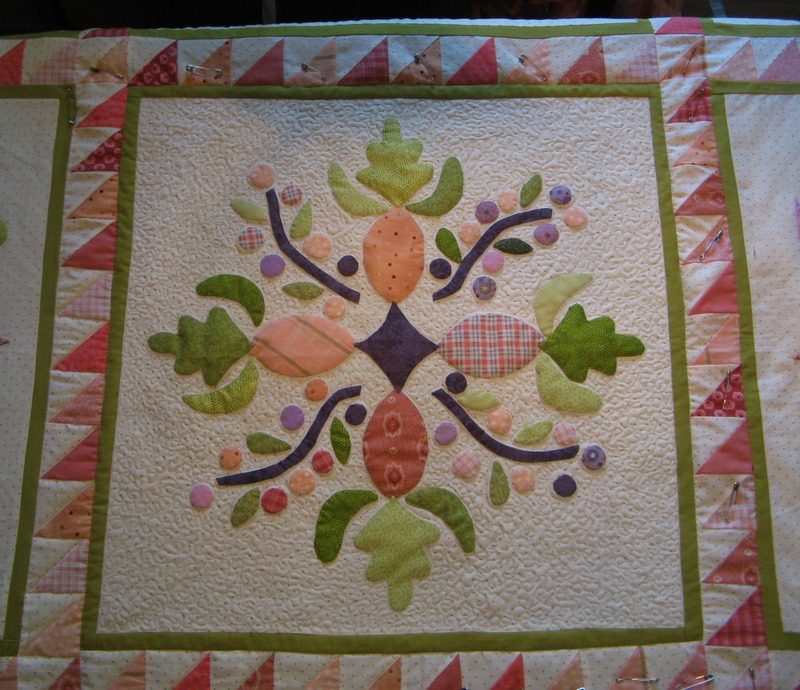 And then I ended up on a course at The Quilt Room to make this quilt in 2005! 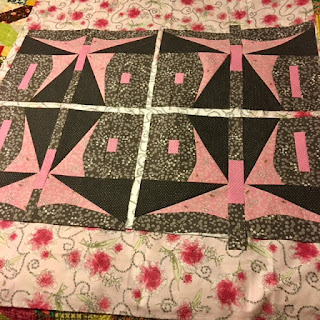 The applique was easy for me but would you believe I was terrified of the HST border round each block and the quilt remained in pieces, and on several FAL lists. Carolyn Forster taught me piecing and introduced me to blogging! Wow has she got a lot to answer for! 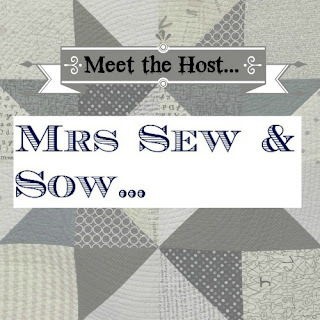 I started blogging as I wanted to record my stitching and gardening - hence my blog name Mrs Sew and Sow! The sewing has taken over somewhat but this year I will be back in my garden and bringing lots of flowers into the house! Wonder if a flower bed can count as a WIP or UFO?? What do you think? 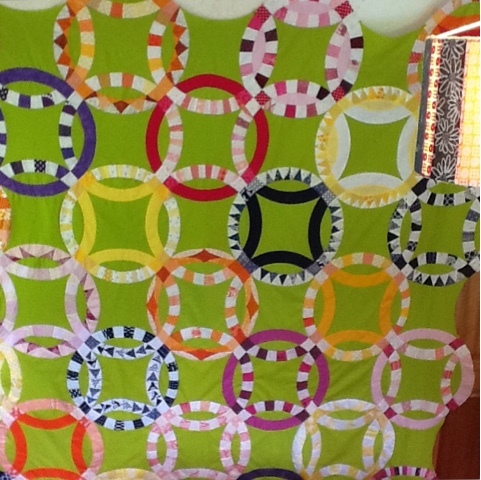 Well back to that quilt I started in 2005 I kept moving it from one FAL list to the next! I have joined up with the FAL since the beginning - though I may have missed a few quarters - and it has helped enormously - mainly from all the encouragement I received from commenters who have become friends. Suddenly it became the time to finish that quilt! 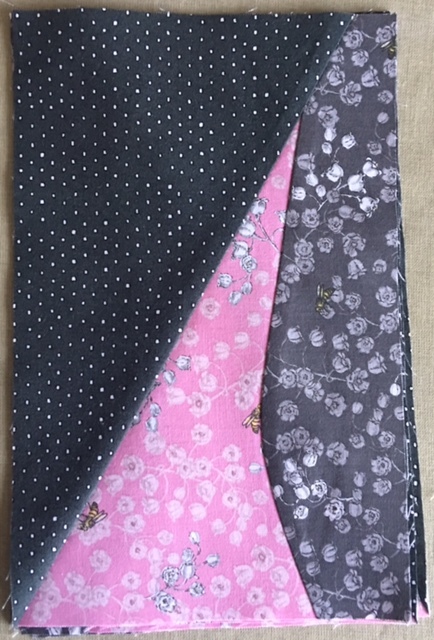 I even had to learn FMQ in order to do it ! And here it is! So all of you who have longterm WIPs/UFOs do not despair! Finishing that longstanding UFO was like a release - it had been a block hanging over me! I started actually finishing more stuff. 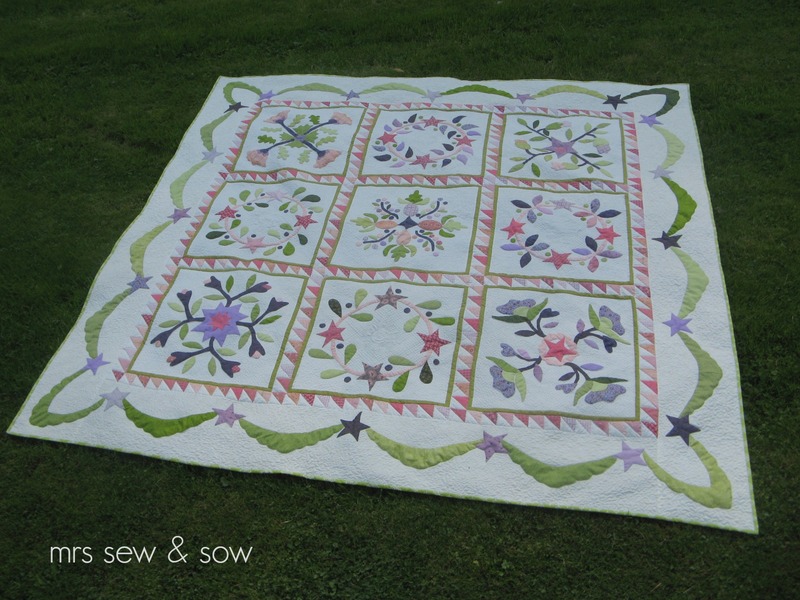 Since 2012 I have been keen to meet up with people, and join in the quilting community. I went to the Fat Quarterly Retreats in London and learnt about the Siblings Together charity. 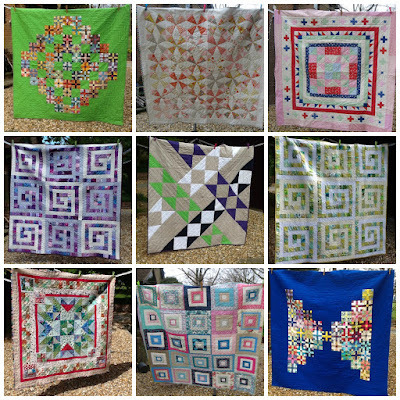 I have been making quilts for the charity since then - one or two to begin with, then I joined a bee to make more, helped others finish quilts and finally last year Maria and I were leading the campaign to make 100 quilts for the charity. The charity helps children in the UK social care system retain bonds with their siblings at holiday camps. They are given a quilt to remind them of the fun times together. 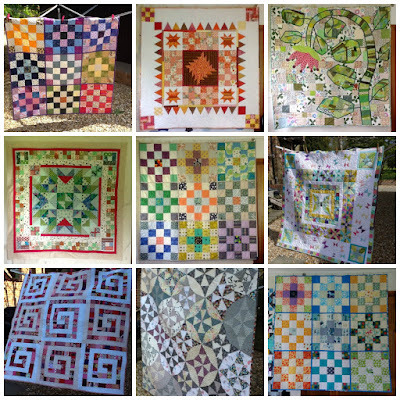 We will be aiming to make another 100 quilts in 2017 with help from a generous community of quilters ! Would you like to join us? You can find more information here and here! 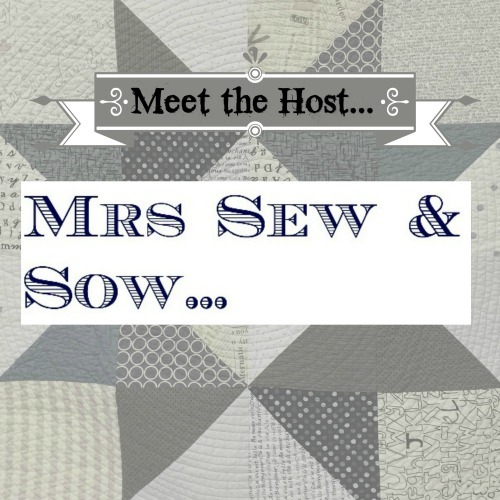 I love scraps and have been running a monthly link up, #Scraptastictuesday, on the second Tuesday of every month, with my co host Leanne (who also hosts FAL). We like to celebrate the origins of patchwork, though Leanne uses scraps in more of an improv way than I do but you will find all sorts of inspiration there! 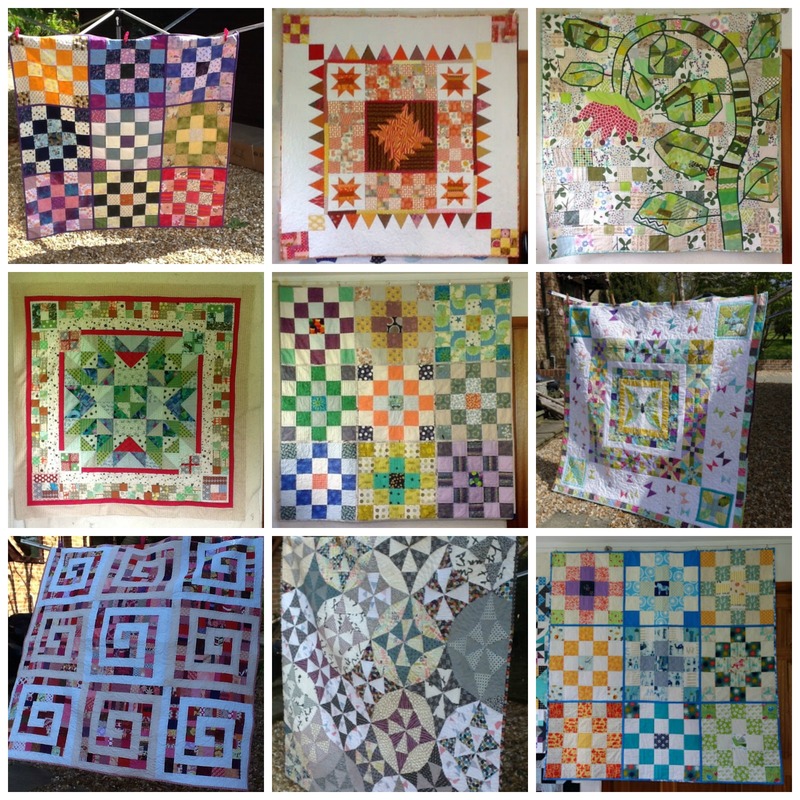 I am a scrappy quilter for ecological and economical reasons! I like to hang onto those pounds and pence and keep my scraps out of the landfill sites! And I just love cramming as many different fabrics as possible into one quilt. We would love you to join us with your scrappy projects (they don't need to be finished), plans, and storage systems. 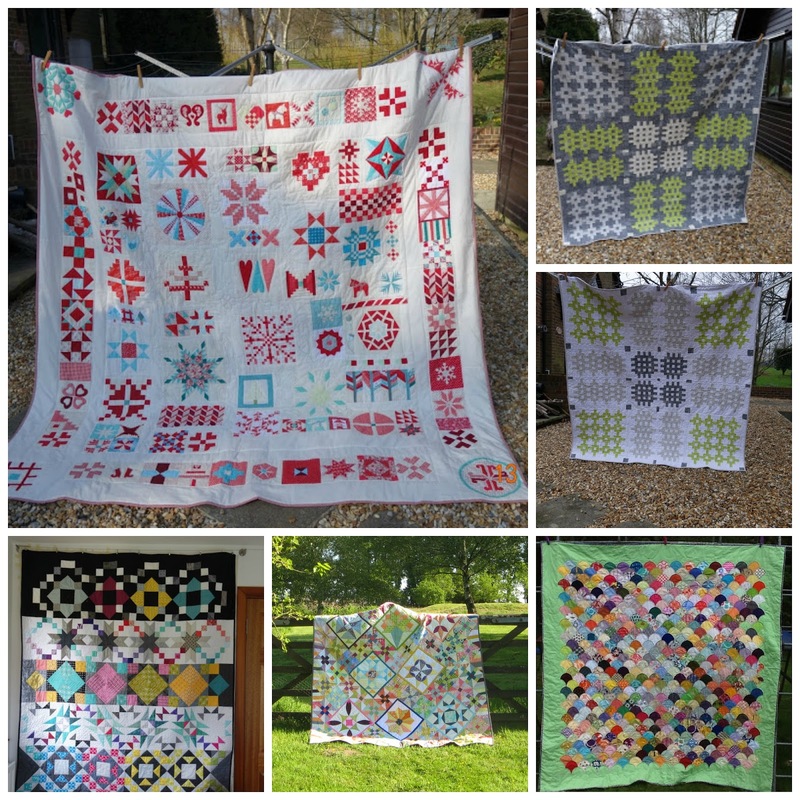 I try to make a scrappy sampler quilt each year with tutorials showing you how to make your own! 2015 is finished and 2016 is basted ready for a finish this quarter I hope! 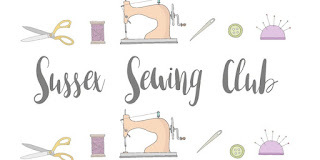 And now I'm setting up a local group of stitchers in Sussex with my friends and co-founders Kelly and Jane and we are actually going to meet up and stitch together in a room! And eat cake! With no children ! It is starting this month ! 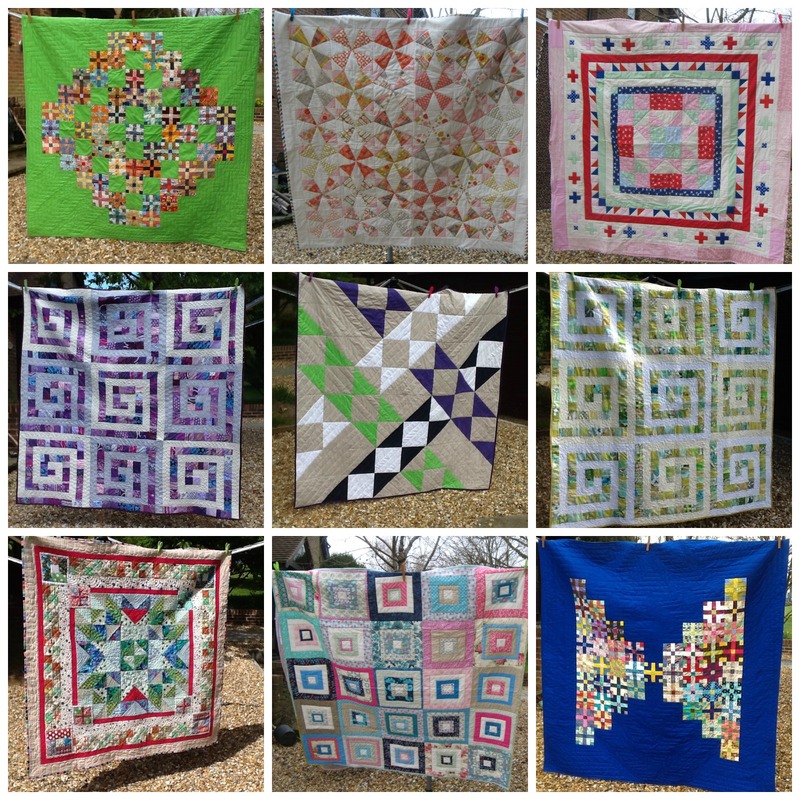 I seem to have made lots of quilts. I find the creative process both stimulating and therapeutic. I do tend to make up my own patterns though on occasion if I love something I will try to make my own version of it. And here is one I hope to finish this coming quarter! It is my take on the traditional Double Wedding Ring (my own variation) - a lot of it stitched by hand! I used acryllic templates made by Marti Michell to help with the cutting and designing of these blocks. My FAL list is always a long one (yes I am a member of Archie the Wonder Dog's #ridiculouslylongFAList ) as when I used to choose a few items for my list I always wanted to work on something else! Much easier to keep everything out in the open I found! I hope you will join us on our journey to complete those listed projects and I look forward to seeing your finishes! Remember to cheer on the rest of the community - it really does make a difference! Thanks Nicky for kicking off the Meet the Host series. Be sure to check back monthly as we share more about the other hosts. 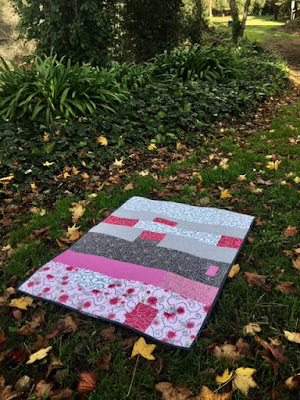 Welcome to my stop on the week long Blog Hop featuring Ink& Arrow Fabrics adorably edgy line called Sweet Rebellion by Felicia Gallo. 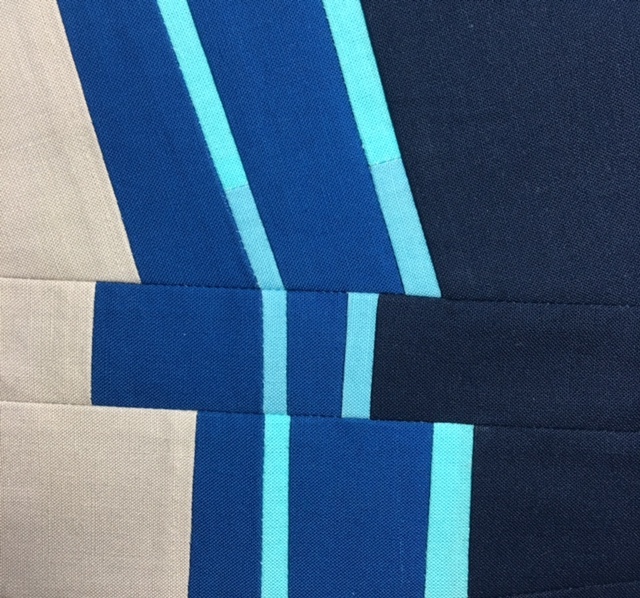 If you’re not familiar with their fabric be sure to browse. I especially love the huge range in colorway of the Pixies Square Dot blender as a nice alternative to solids. 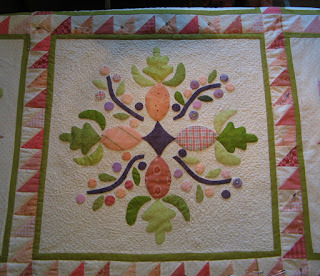 I had the opportunity to play around and bring to reality an original quilt design thanks to Ali and Courtney at W.O.W. Wives of Whitewood. 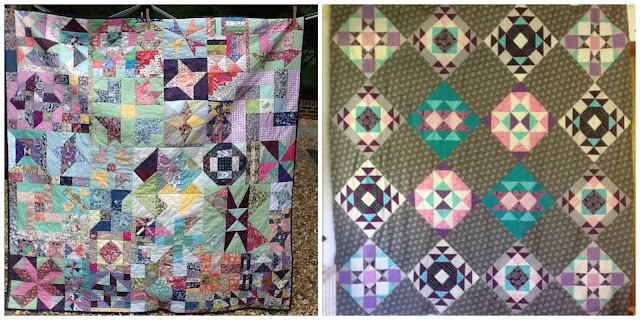 Visit their blog and check out the other Sewing Challenge projects that have been created. 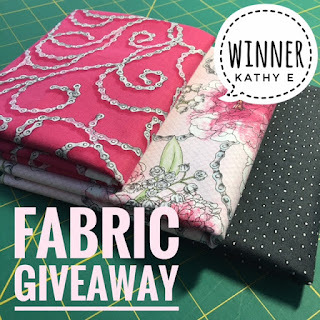 If you hurry to Instagram you can enter their enormous fabric giveaway, 17 half-yard cuts, eek! I knew it would be original, somewhat unexpected with a touch of tradition, just like the fabric line. Unclear about which one to pick, I decided to just start sewing the "spiky shape" portion and see where it landed. The Packed Lily of the Valley in gray and pink became the main feature and almost immediately a butterfly shape began to present itself. I went through several renditions before committing to the one that felt most rebellious. 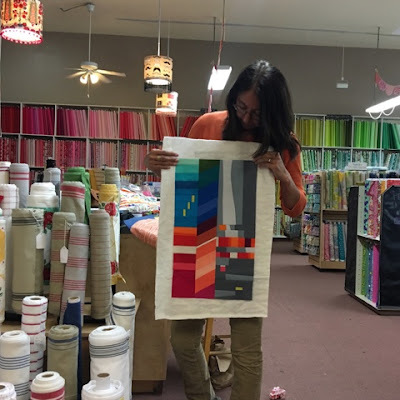 For my stop on the hop, rather than a "how to " tutorial, I'm going to share about my process and the steps that led to the final Dare to Fly quilt design. When you're making it up as you go, you can spend a lot of time playing around the the endless possibilities. And because there is no one right answer (in my book at least), it can be quite a game. One that I love to play and you might too. 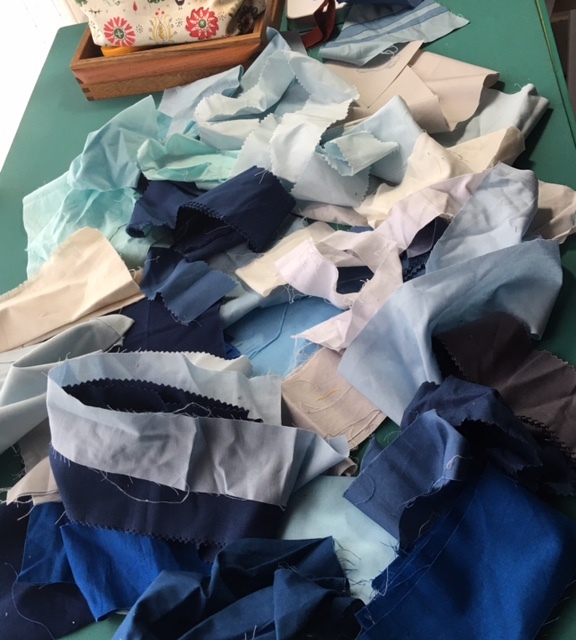 Placing bits of fabric here and there can give a general idea what it might look like sewn in. Using a mosaic app on your phone is another cheat. Because I try and stay 'in the creative zone" the pictures aren't pretty but rather a tool for decision making. Secondary patterns can be tricky. Especially with a dark fabric, or collective mass. Something small can take on an entirely different scale and become overwhelming. drawing attention away from what you are trying to feature. 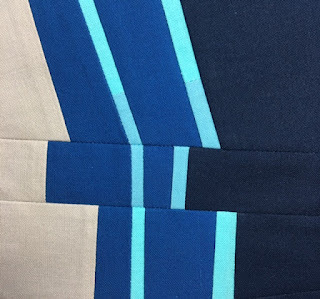 Sashing and inserting small bits to break up space is one solution. I decided that i liked the movement of the final layout although the placement in the sample below was a close second. The butterflies felt to pushed to the edge and the center plus too focal. There's also the chance of unintended shapes to watch for. My hubby thought one orientation looked like a bunch of mustaches and another I thought resembled crab claws. Abstract yet recognizable is also a fine line. It's easy to get chaotic but allowing the eye to rest is an important part of being able to enjoy the shapes. I think surrounding the center with the sweetness of the Peonies & Chains print brings it all together and lends a traditional vibe. 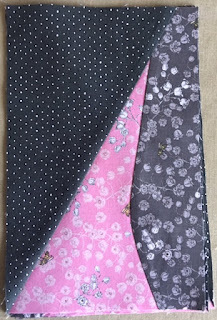 Inserting a thin inner border of dark pink chain compliments the flowers and extending the horizontal line emphasizes the movement of the dashes. For the quilting motif, I went for an overall swirl to mimic the chain swirls. 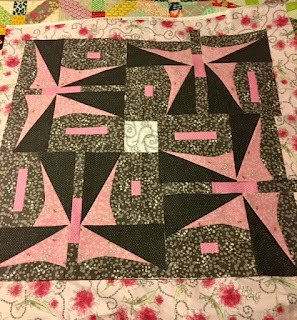 My friend let me use her longarm for not only this one but the soon to be blogged about SBAMQG design challenge quilt (Get a Grip) that needed to be entered to our local show immediately. To speed up and eliminate the step of loading individually, I sewed the backs together. A handy trick even if it looks a little odd. Easily distracted might be an accurate description of my creative process as well. During the early experimentation stage of the spiky shape I took a detour to sew an art supply pouch as a birthday gift for my son's girlfriend. Using a vintage zipper and making it extra long to house scissors, brushes or whatever she might want to keep in it. I think there is a certain "vantage point" to the design which I think of when remembering art lessons. Riding a bike off into the sunset also came to mind. My favorite part is the circle and illusion of the peak through. I didn't fussy place the chain but you get the idea. I cut the "block" in two parts so that it would flip and make the most of the elements that I liked on both sides. I'm giving away some extra Sweet Rebellion fabric from my projects (domestic shipping only please). Leave a comment letting me know you'd like to be entered and about any design related topic. I will pick a winner a week from today. 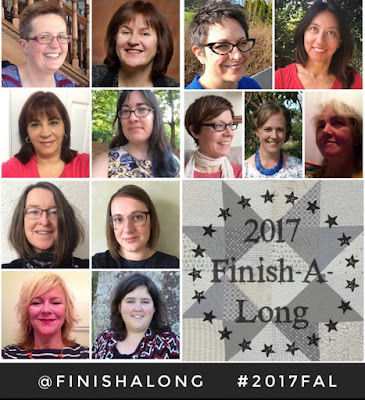 EDIT: giveaway closed/congratulations Kathy E.
Last but not least, don't forget to link up your Finish Along 2017 FAL Q1 goals before the linky party closes on the 14th of January at 11pm EST. You can read all about it in the Finish Along tab above or the blog post here. Check back to learn more about the 2017 Hosts as we introduce them each month starting on the 15th.